The retirement residence that my grandpa lives at serves 2 meals a day – lunch and dinner. A early morning continental breakfast is served in the breakfast room but many of the residents break the fast in their suites. Like airplanes and hospitals, the thought of food in a retirement residence pulls up thoughts of industrial, lacking food. But at the Mulberry, the food is pretty good. Each day there is a menu, but if you don’t care for the feature, you can opt to have one of the three or so back up meals. These back up meals change each month as well, so there is ample variety. And if you want a fried egg or the like, the kitchen will try to get it for you. Residences can have guests join for meals as well – for an extra fee – so I have eaten a number of meals at Mulberry. On Sundays, the hot lunch often is breakfast fare recalling leisurely Sunday brunches from years before. I awoke on Sunday morning with a hankering for scrambled eggs, bacon and toast – a real breakfast. And when I considered my options, I realized Mulberry was the best bet. There is always breakfast available and the company is pretty good. October 28th, 2012 Extra-Ordinary: Double portions for the guests – Mulberry is the best deal in town. Greetings from Havre, Montana and the Town Inn and Suites. After a short night in Grand Rapids – well it seemed pretty short – and a grand breakfast, we hit the road again. You know “Breakfast included” in an American Hotel is significantly better than the lousy “continental breakfast” offered in most Canadian hotels. In every hotel we’ve stayed in during the last month, the American ones include make your own fresh waffle, oatmeal, biscuits & gravy, yogurt, fresh fruit, eggs, bacon/sausage, or a various combination of these. It’s fabulous. Emile usually grabs a hardboiled egg and I an extra yogurt and we’ve got our stops for the day. Pay attention Commonwealth! 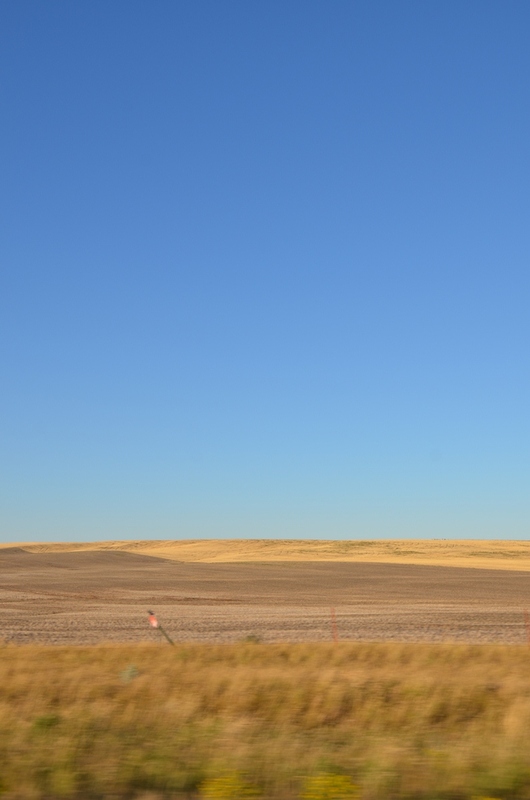 We were excited to get to North Dakota – it adds another state to both of our collections (we only count states that we have actually been outside in – Emile’s 2 hour layover in LAX does not count). I’ve been to 21 (California, Hawaii, Idaho, Illinois, Indiana, Louisiana, Michigan, Minnesota, Missouri, Montana, Nevada, New Hampshire, New York, North Dakota, Ohio, Oregon, South Dakota, Vermont, Washington, Wisconsin, Wyoming). Emile has been to 23 (Florida, Georgia, Hawaii, Idaho, Illinois, Indiana, Maryland, Michigan, Minnesota, Montana, New Jersey, New York, North Carolina, North Dakota, Pennsylvania, South Carolina, South Dakota, Virginia, Washington, Washington DC, West Virginia, Wisconsin, Wyoming). 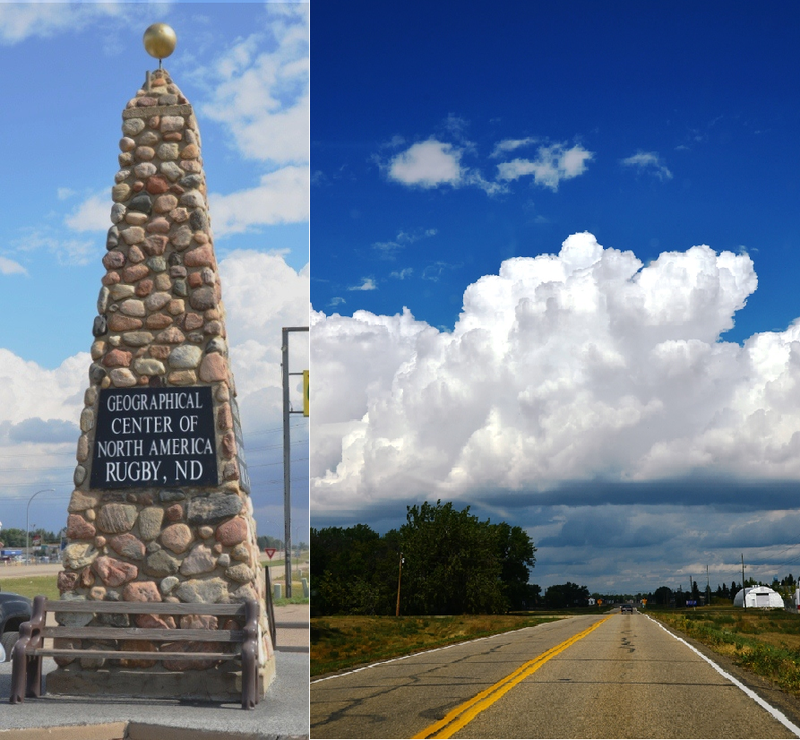 The most exciting part of North Dakota was visiting the Geographic Centre of North America. I guess that should be Center – but I think that is ethnocentric of the US to use their spelling, don’t you think?? There it is. Built in 1932 (the monument not North America) Emile was more excited about the fantastic cloud formations, I think. Both of us had to sit as tall as we could with the sun visors down while squinting and wearing sunglasses to be able to see. Fortunately, Highway 2 – north of the main freeway – is very quiet. It is not uncommon for us to spend a half hour without seeing another vehicle. 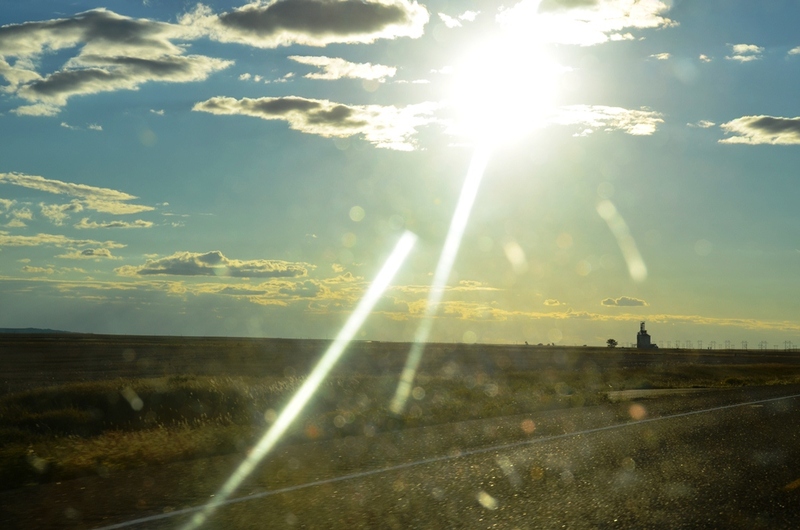 The sun sets in the west, I’ll tell you – I hope there is no permanent damage. While in the US, we don’t use our cell phones due to the high data/roaming rates. I engage in the practice of War Driving – so named from the movie War Games. I race to see if I can connect to unsecured Wi-Fi and download my messages before Emile pulls away from a red light. I like to see what people call their Wi-Fi points: hurricane, tornado, getyourown, notyours, mine, thelassie, or my favorite “Linksys”. If you laughed when I said “Linksys”, you failed the geek test. Each time we stop for gas (or peeing), I am wandering around the parking lot trying to find a strong unsecured connection. We had an early evening relatively speaking and pulled into Havre – land of the low-end casino – at 10 pm. We’d stopped to get Oreos and milk for Emile and he was eager to relax while watching TV and eating his American treat. September 6th, 2012 Extra-Ordinary: Being exceptionally disappointed that the honeymoon suite bed (the only room left at the hotel) didn’t have the heart-shaped king bed like the clerk said it did. Who doesn’t want to sleep on a heart shaped bed once?